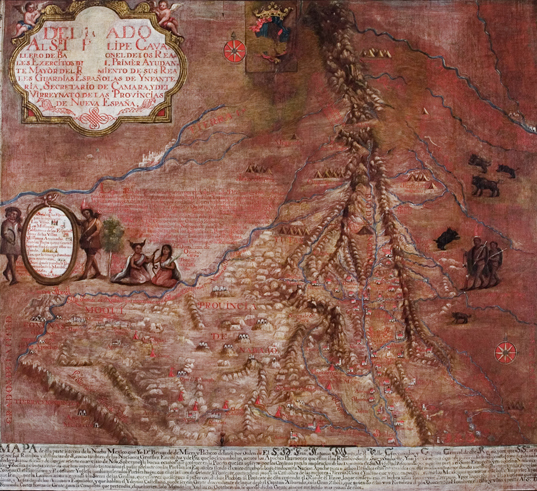 Groups of New Mexico educators found their way to the New Mexico History Museum this summer for a free, one-day workshop focused on teaching with historic maps. 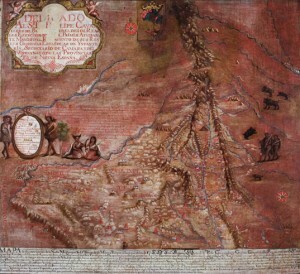 Led by educators Dennis and Judy Reinhartz, with assistance from Patricia Hewitt of the Fray Angélico Chávez History Library, the sessions drew from the museum’s extensive map collection. Attendees received extra insights on a number of maps through slideshow presentation, hands-on access to a few print maps, and a gallery walk-through with museum docents, who shared information on some of the maps with museum exhibits. While preparing an upcoming exhibit, Virgin of Guadalupe: Empress of the Americas, the Houston Museum of Natural Science asked to borrow our morion helmet (left) and a breastplate. 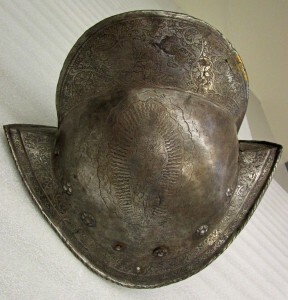 The 16th-century pieces were found in a cave in Grants’ El Malpais and given to the museum by then-Rep. Nick Salazar. Why the interest? Both bear delicate etchings that include Christ on the cross and Our Lady with the Christ Child. But Houston, we had a problem: Both are on long-term display in Santa Fe Found: Fragments of Time, and we didn’t want our exhibition to suffer.